As I wrote in the book. ‘So there you have it. As a result, Ancel Keys stormed off, put together a huge research budget, hired a staff of thousands, did his study and was the able – in objective ‘scientific speak,’ of course – to say ‘I told you so, I told you so. Nyah, nyah, nyah.’ Not, as I pointed out, the best possible motivation for a research project. Of course you are going to have to take my word on the exact events described. For, shortly after my book was published, this passage was removed from the University website it was on, never to be seen again. Cause and effect, who can say? But it does raise an important issue. If there is no record of a thing happening – did it happen? If you control the historical record, what is truth? In the age of the Internet you might think it is more difficult to hide the historical record, but in some ways it is easier. If something only exists on a server somewhere, all you need do is delete it and it is gone – forever. Unless you ensure that you archive it yourself – something I did not do with the Henry Blackburn quote. At this point you may wonder where this is all going. Well, for some years, I have used statistics from the European Heart Survey which looks at data from nearly a million people. The latest version is here http://www.bhf.org.uk/publications/view-publication.aspx?ps=1002098. This is very impressive bit of research, and is full of good stuff. For a few years I have included statistics from this study to produce tables such as the one below (See table). The table makes it very clear that saturated fat intake has absolutely nothing to do with the rate of CHD deaths in any country in Europe. In fact, in general, the association is completely inverse i.e. the more saturated fat you eat, the lower the rate of coronary heart disease (CHD). Twenty times as low in France, as Georgia, despite the French eating three times as much saturated fat. This, of course, completely contradicts everything you have ever read about the impact of saturate fat on heart disease. Jerome Burne, a friend and colleague, and medical journalist, wanted to use a couple of my tables for his blog. So I sent them over. He pointed out that my data was from the 2008 survey. In the latest 2012 survey – it take some time for the data to be published – the figures on saturated fat intake have simply gone. They are no longer published at all. I hurriedly went back to the search the 2008 data to make sure that this had not been wiped from the record. They have not, although it is rather more difficult to find. I have now stored these data on my computer, and archived them. For I suspect that these data on saturated fat intake will gradually disappear from the historical record. Of course, I am going to write to the researchers in charge of the European Heart Statistics and ask them why, of all the data, the data on saturated fat no longer features. Why have they done this? I strongly suspect I know the answer, and I suspect that you do to. I am going to write although I already know the type of answer I will get. It will be some complete fudge, not answering the question but saying something along the lines of ‘Our panel of International Experts constantly review the data that we include and make decisions based on priorities that are determined by many different factors. For various reasons not all data are included, but we are always working to ensure that everything is done to provide the most useful and up to date information. Unfortunately, it is not possible to enter a discussion on specific issues.’ Beep, message ends. It has long amused me the European Heart Statistics – if you look through them carefully – contradict almost everything we have ever been told about the causes of heart disease. Of course they are now somewhat less contradictory, because they have removed the data on saturated fat. This entry was posted in Dr Malcolm Kendrick on September 13, 2014 by Dr. Malcolm Kendrick. Right on! And the same principles can be used to see how our governments are co-creating the 1984 world of the future past. Excellent observations as usual Malcolm; Orwellian stuff indeed….but in fairness there must be some damage control deployed, to manage the magnitude of their decades-long error…. Another scary scenario. Glad to hear you will be contacting the researchers albeit knowing what the answer will be. At least they will be aware that you know the score. 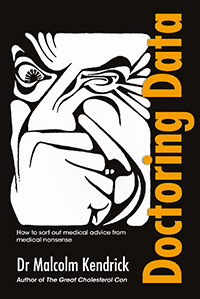 Keep up the writing Dr K – and thanks on behalf of everyone! From the body of the material I have read that makes mention of the personality traits of Dr Ancel Keys I tend to agree with yours. That he had an inclination to be summary, impatient, and lacking in humility is an impression other accounts convey. His six countries study from 1953 which pre-dated the seven countries study was initiated by a challenge from the floor asking Keys to provide evidence backing his theoretical stance upon the supposed angiotoxicty of saturated fat while he was promoting his theory before an audience at a convention. He had not he could offer. That he went away and cobbled together some evidence is indicated by Yerushalmy and Hilleboe who exposed the weakness in Keys six countries study (1953) in 1957. The data was suspect for absence of standardisation and Keys abused the available evidence for selecting just 6 data points from a possible 22. The 22 showed no association where Keys selective use of 6 data points implied one. It is easy to take data posted to the internet and store it on ones own drive, it is also a darned easy exercise to forget to do. For instance I do not back up the comments I post to your blog, something I could easily do, but you have principles which respect transparency in the affairs of debate. I hope your blog and everybodys’ comments might remain for perpetuity, and if not for all of perpetuity, then for a long time yet; and what I know of you suggests they will. Maybe someone has a copy of that disappearing data, maybe someone has access to the non-public archives, maybe it will turn up on Wikileaks, maybe it already did. It’s bad enough that public health had to suffer in order to prop up the vulnerable narcissistic ego of Ancel Keys, but it really is truly shocking that the truth should now be erased in order to preserve the now established status quo. All power to your elbow, and may you long continue to ferret and fight. Firstly, does it really matter what Keys was like as a person? – focusing on his personality has nothing to do with the veracity of his arguments or data – it is simply ad hominem. I’m not sure that in 1953 Key held the “theoretical stance upon the supposed angiotoxicty of saturated fat”. The paper in question looks at total fat intake. I’d be interested in evidence to the contrary however, do you have a reference? With regards Yerushalmy and Hilleboe (1957) they actually found that “the selection of the original size countries, for whatever reason, greatly exaggerated the importance of the association. Nevertheless, the scatter of points in Fig 3. suggest that there is some association in the conventional sense between two variables” i.e. a weaker association between total fat and CVD mortality, not zero. Motivations are of critical importance in all fields of human endeavor. “What makes a cool URI? URIs don’t change: people change them”. Thanks. I have been bombarded with information on this. The state of Science is a real worry; Climate Science and Medical Science in particular seem simply to be morally corrupt. Perhaps it happens eventually to everything that State Power and State Funding encroach on. It’s also the corporate world. A year or so ago I looked again for a newspaper article I had previously found online on the website of an internationally renowned newpaper (not British). It was about a corporation that had been found guilty of gross negligence and various other charges concerning its toxic waste. I found that the newpaper’s own online version of the article had vanished and been replaced with a rewritten article (though still carrying the original date), now with a slant suggesting the charges were perhaps not true – despite the company having been found guilty. There was no mention that it had been rewritten. I have been having my own thoughts about our Orwellian world too. – My guess is certain political parties, business, and individual academic reputations all sharing a commonality of purpose, if not conspiracy. But the People will be the collateral damage, not the beneficiaries. Have you thought of setting up a website with some of the most relevant statistics on display? I have often directed people to your blog, but the trouble with blogs, is that it is less easy for someone new to the subject to find the information that is most relevant to them. I know it is extra work, but once set up it will last for a while. When my book is out I may spend some time on this. I’m really looking forward to your new book. Have you got a publication date yet? When do you expect it to be out? What medical issues will it cover? Will it cover any non-medical scientific issues? Will it overlap much with The Great Cholesterol Con? Having checked the reference you provide in your book (www.epi.umn.edu/about/7countries/index.shtm) via the wayback machine I am struggling to find anything which resembles the text cited in the book, or even the page in question – “index”. There is an “overview” page archived on June 22nd 2007 which is by Henry Blackburn but this seems to be an alternative page entirely(http://web.archive.org/web/20070808191554/http://www.epi.umn.edu/research/7countries/index.shtm). Could it be the case that rather than the passage in question being selectively wiped from history, it was replaced when the whole page was rewritten? Also, I’m not really sure why you think this passage from Henry Blackburn is such a smoking gun anyway – he says Keys set out to find “definitive evidence to establish OR REFUTE” the Diet-Heart theory” (my emphasis). Isn’t that how science works? You presumably are arriving at this discussion with a particular point of view on saturated rat already in place? Perhaps you would like to share it with us? Of course, we all do. I think its fair to say that my previously held beliefs – about there being a simple strong relationship between saturated fat and CVD – were inadequately informed, considering the complexity of the issues involved and the amount of evidence I hadn’t looked at. That’s why I bought “The Great Cholesterol Con”, to seek and understand the counter arguments. Now we have that out of the way, would you consider addressing my points? 2, Keys is reputed to have made a proclamation at the outset, perhaps even before he embarked upon ‘research’, that he would investigate CVD, identify its cause, and reduce death rates from same. He was contracted to Uncle Sam, in effect, as part of the war effort, and cessation of hostilities might have result in an abrupt shift to the terms of that relations, and his moving to investigate CVD could have been influenced by concerns for death rates from CVD in political circles. But basically how could he present himself as being so assured he would solve the riddle? I lately learned in an alternate setting that policy during the 1939 – 1945 conflict had German articles and journals translated and distributed to academic institutions. Periodically new translations of ‘old’ material originally published in Germa would arrive at Universities. In a least one other instance I know of this alerted individuals to a promising result from decades before whose significance had been ignored. I would conjecture that Keys encountered a translation of Anitschkow and Chalatovs write-up on experimental atherosclerosis in the rabbit during the conflict and had it rest on his mind while he was busy starving conscientious objectors close to death and in the name of research. By the time he re-channelled his efforts upon ‘research into CVD’ in his mind he had already half modelled the outcome, it might appear. I think Keys, focused as he was on diet, believed diet had to be the culprit (in some way). He started off trying to blame cholesterol, but found that cholesterol intake had no effect in humans. So, he switched to the next possible villain, animal fat(s). Here is where he planted his flag. Once planted, never moved. Fame and influence came his way and those are powerful sources of bias indeed. I think he convinced himself he was right, he then convinced the world. Perhaps we are lucky he was not a politician or religious leader. He obviously had the charisma required to direct people’s thinking. Following on from your comments on the WHO-EU-Monica eurovascular study of nutrition I downloaded the data. I regressed the national percentage availability, saturated fats (classification dropped in later versions) fruit and veg and by subtraction carbohydrates (the word carbohydrate was used but once in the first final report ????) against the national incidence of heart deaths as per Ancel Keys. The authors never thoroughly examined their data. They were merely content to go with the current myth. Another example of claiming something their data did not support. I know you are against references to Global Warming in your blog but the parallels with statins/heart disease are uncanny. Warmists have altered entries in Wikipedia to edit out references to any and all facts that do not fit with their theories. For instance the medieval warm period, which has been accepted for many years, “disappeared” and when it was replaced it was removed again. Temperature records have been “revised” – always down – so that, overall, the trend is upwards to fit the theory. The Australian Bureau of Meteorology has recently admitted it “homogenised” the temperatures from 1910 to 2010 for Rutherglen, Victoria so that they rose instead of falling. I’d like to know how many other so-called scientists are fiddling the facts to fit their theory a la Ancel Keys. I think it is all very interesting. I just try to keep a bit of focus on here. Please don’t think I am trying to shut down conversation, I just feel a bit unqualified in this area. I am beginning to suspect that most (maybe all?) large science projects are bogus! 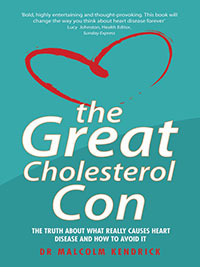 One of the frightening features – illustrated in “The Great Cholesterol Con”, is the tendency to manipulate raw data, with absolutely no recognition of the dangers inherent in that process. Cern generates so much data that the overwhelming majority of it has to be filtered and discarded on the spot – by layers of electronics – so there isn’t even a record of the raw data! That fact alone makes you think – for a 9Billion project! BTW, I do mean overwhelming – each Higgs particle is ‘discovered’ by discarding 10^12 background events! Above all, he makes a plea for data transparency (together with computer code) – which seems incredibly relevant to medical science too! That’s why we need access to raw data, then everyone can make a call. The fundamental flaw with that proposition, and again it’s all areas of expertise, is that if we had access to the raw data we may, or very possibly would, come to the “wrong” conclusion. We know that millions suffered and died as a direct result of WWII. I wonder (assuming the German journal translation story is true) if we should now add the millions who have suffered and died as a direct result of the diet / drugs policies implemented by governments worldwide based on faulty research and reasoning, which had their beginnings during and because of, that very same war? Or as modern day generals would say, just collateral damage…? Perhaps not, look at https://archive.org/web/. – but concluded you shouldn’t eat fat or cholesterol anyway, because science. I found this: http://aje.oxfordjournals.org/content/early/2012/11/19/aje.kws374.full which includes an account of George Pickerings confrontation with Ancel Keys in 1955. With citations. “Why have they done this? I strongly suspect I know the answer, and I suspect that you do [too]”. To put it crudely (which I think is the right way), because people who want money very often do things that people who have lots of money would like them to do. All those former Soviet states have a long involvement with seed oil (industrialised since 1840s) and soya products (since the 1920s). If the lipid hypothesis was correct, they’d have conquered CHD. As it is, France, world”s highest per capita butter consumer, is closest to that goal. Go figure. Canada (my country) takes great pride in being the inventor of Canola Oil, from the canola flower. It has to be processed at high heat, and is apparently the most unhealthy oil that ever existed, but farmers get cash bonuses for growing it. It’s also one of the least productive plants, so much acreage must be used to extract a minimal product. The older I get, the more I think that this type of behaviour (and it isn’t limited to the scientific community) isn’t all that much to do with money. An idea, a viewpoint, coupled with pride becomes increasingly so entrenched and intractable within the person, that seemingly no matter what evidence is presented to show that the idea or viewpoint is false, the evidence is simply dismissed or “explained” away. It’s something that I would never have believed possible in people who are supposed to be rational and logical. Don’t assume that just because someone is “educated”, that they aren’t stupid. And, don’t assume that such people are in the minority. The trouble with that, is that clearly people in the past *did* discover new facts and push them past those who favored the status quo. Unzicker repeatedly points this out in the book that I referenced above. Science has changed from a form where new ideas and corrections of mistakes did make it to the light of day, to institutional science where it seems as though no amount of new evidence and time to reconsider can eliminate mistakes. As you can see from Marcus’ reference (above), Ancel Keys was directly confronted about his ‘mistake’ and yet the demonisation of saturated fat continues to this day! The awful truth is that individual medical researchers have woken up to the mistakes about fat, salt, and cholesterol over and over again! I’ll bet that each time this happened, they thought they were about to change something for the better…….and absolutely nothing has changed! I think the only way is for people as a whole to become aware of just how broken institutional science is. To an extent, they are realising – just look at the cynical comments in the Daily Mail following any article on health – but I don’t think the change can come from within the institutions. Recently someone made me aware of an interview with a retired, well known, politician in Sweden. She told that she in the beginning of her carrier, which must have been about 40 years ago, had been involved in directing funding to medical research. At one occasion she had been approached by a researcher who had whispered in her ear to stay away from the margarine for the sake of her children and an advise which she truly had followed. The scary part for me in this story is here not only that the dangers with the transfats evidently was known in the research community at that early date but that a politician of this caliber didn’t do anything for a change but, in this case, only to save her own family. A cover up of 40 years of criminal industrial activities is quite an achievement in a political sense. Dr. Kendrick- has the information in this table been corrected for quality of medical care in each given country? Access to medical care, as well as advancements in treatment have greatly improved prognoses in modernized hospitals. It seems to me that this is an important thing to consider when looking at CHD deaths. I would guess that the trend would still be apparent, but not nearly as dramatic. Logan, you are correct. To a degree. However, at least 40% of CHD deaths occur outside of the hospital setting. The most important issues, however, is that if you start correcting for unknown variables you start upon a slippery slope called ‘assumptions’. Very interesting but I can’t see where your figures for CHD come from. for various years between 1980 and 2009. Just wondering how you get the figure of 235 for Georgia ? It appears to me that Ukraine and Russian federation are much worse than Georgia. The figure of “235” is taken from the 2008 version of the European Heart Survey (Table 1.4, page 28), but there seems to be a discrepancy with these figures when the report was updated in 2012 and the Georgia figures have been adjusted. The rest of the figures are taken from 2004, 5 or 6 and tally, and presumably the saturated fat % come from Table 5.5 of the 2008 report (page 75)? These are minor issues however when you consider the bigger problems with using cross sectional data to draw definitive conclusions. Firstly confounding factors. There are other risk factors for CHD which have not been adjusted for in these figures: smoking, high blood pressure, exercise, diabetes etc – can we really assume these are equal across all of these European countries and that we are looking at just the relationship (or lack of relationship) between saturated fat and CHD? Logan rightly points out above that socio-economic factors will strongly confound any pattern here, and a cursory examination of the wider data confirms that CHD mortality is lowest in the richest countries which have the best access to good quality healthcare. This is obvious really and a consequence of looking at CHD mortality rather than prevalence – someone suffering the consequences of CHD in the Ukraine does not have exactly the same chance of then dying of it as someone is Switzerland. Perhaps the most fatal flaw in this argument however is the central assumption that CHD deaths in 2004-6 have to correlate against the saturated fat intake for 2008 i.e. a contemporaneous relationship between saturated fat and CHD. Is this reasonable? Doesn’t the diet-heart hypothesis predict a lag between saturated fat intake and CHD or years or even decades? This makes a simple cross section analysis useless as it cannot take into account changes in fat consumption and the historical levels of consumption. Your points are very valid. You will note, however, that I have never stated a ‘causal’ correlation – anywhere. I just point out that the figures for saturated fat consumption have no relationship to CHD deaths. In fact the relationship – such as it exists – is very strongly negative. One should bear in mind, however, that the entire diet-heart hypothesis was started by Ancel Keys who looked at saturated fat consumption and CHD deaths (in the same time period), and persuaded that world that saturated fat consumption caused CHD. What is sauce for the goose must also be sauce for the gander – must it not? As for the ‘time-lag’ hypothesis. Perhaps true, perhaps not. It is just another ad-hoc hypothesis, created to immunize against the French figures of CHD death. My own view is that diet has almost no effect on CHD death rates. The data strongly support that view. In fact, it is the only view that the data support. Lots of noise, very little signal. My view too – the most plausible explanation is, that diet usually has little effect on CHD risk unless it causes another disease which does influence it, such as diabetes. It surprises me here to read your view that “diet” should have almost no effect on CHD death and thus exclude our eating habits from among all factors suggested as causal. Of course it might all depend on what you assume to be a diet. We are a large number of anecdotes in Sweden (LCHF adherents) who are though “believers” in such a hypothesis. The main thing reported among us believers, most of whom are victims of the metabolic syndrome, is that we seem to master our inflammatory diseases pretty well, and not least DM, by cutting out the carbs and replacing them first hand with the saturated fats mostly of animal origin. It would be very interesting to hear you expand on this topic. I will probably expend on it in a blog. Personally I cannot see any clear cut evidence that any diet has much (if any) impact on CHD deaths. We are eating more carbs than ever (in the West) the CHD rate continues to fall. There may well be other factors at play, but it is hard to point the finger at carbs being very dangerous (at least for CHD). I would tend to make one important proviso here. Namely that if you have insulin resistance/type II diabetes LCHF is advantageous to weight loss and metabolic health. Thank you for your response and I am locking forward to your future expansion on the subject. Such an elaboration can add positively to the debate not least in Sweden. You mention insulin resistance and to me this state of affairs is more ore less synonymous with the metabolic syndrome and of course with the type II diabetes and I guess, without knowing, that this resistance is also typical for people like me with severe CHD. Anyway, with anecdotes like my wife (type II) and myself a strict LCHF seems to work fine and we measure amazingly fine blood sugar values; now 5.2 and 5.6 one hour after our main supper. My own view is that diet has almost no effect on CHD death rates. Not even processed / trans fats / vegetable / corn oils coupled with high sugar / HFCS? Steven. Show me the evidence, the trials, the outcome data. I have sympathy with Steven’s view, just in the sense that by now, I doubt if any study of diet can actually be run correctly, or survive an onslaught of efforts to adjust the results to what they should be! Sugar and easily digested carbohydrates are an exception because sugar causes diabetes, and the mechanism doesn’t seem contentious, and diabetics get more heart disease. Do you have some good links to the evidence against trans fats? The ORs for those factors are not as high as they would be if directly causative of CHD. They don’t help, and probably contribute to diseases that indirectly contribute to CHD, especially diabetes, but are also markers for malnutrition and processed foods. Re diet etc above. There’s a lovely correlation between HBA1c and CVD. Controlled trials and observational studies provide concordant evidence that consumption of TFA from partially hydrogenated oils adversely affects multiple cardiovascular risk factors and contributes significantly to increased risk of CHD events. The public health implications of ruminant TFA consumption appear much more limited. The effects of specific TFA isomers require further investigation. Eur J Clin Nutr. 2009 May;63 Suppl 2:S5-21. doi: 10.1038/sj.ejcn.1602973. OK, I will give you trans-fats. I have always been against them, and I think the evidence is pretty robust that they can cause harm. As always nothing can ever be “proved” – only made more or less probable! I can therefor never prove that I am still alive today, after my close to the edge CHD experience 15 years ago, due to me throwing out all food containing “partially stabilised vegetable oils” which is though found in almost all processed food and margarine in particular. My decision was based on the fact that my “limited research” had made a causative effect probable to me. As every anecdote I now tend to believe in what I did was the right thing to do especially since I against all odds seem to do rather well today and refusing all “remedies” offered to by the medical experts including the statins of course. Anyway it is not unreasonable to suspect that the transfats did contribute to my state of affaires when locking into my eating habits at that time. Although consensus can never be science and science never consensus growing evidence make authorities in different countries today ban the transfats. For whatever it is worth I note that IKEA promise that they don’t have any of them in the food they are serving. You may ask what “any” means but it sound promising to me since I believe there is a dose-response factor involved as by the way even with water – a deadly stuff. If information disappears from the web try looking for an archive of the website of interest using the Internet Archive Wayback Machine – http://archive.org/web/ – “430 Billion web pages saved over time”! Trans fats are harmful but rather than being completely eliminated, changes in food labeling means that even a “foodstuff product” with zero % trans fat can still contain 2.2 grams of trans fat in every serving! And even when vegetable oils aren’t being hydrogenated and eaten in margarines, cakes and biscuits etc and are used for frying as a liquid, they degrade into toxic oxidation products (never mind the glyphosate contamination and genetic engineering prevalent in modern varieties). That’s just the vegetable oils / trans fats but the sugar / HFCS connection to various metabolic diseases and CHD is pretty well established as well. We are eating more carbs than ever (in the West) the CHD rate continues to fall. Sorry if you have a pile of submissions on this, but it is a good example. I wonder who then thought that it was essential to contact Professor Naveed Sattar and Professor Jeremy Pearson. The Professors seems content that your 12% risk of developing type 2 diabetes over 4 years (how much greater must it be over 10 years? 25%? 35%?) outweighs your 10% risk of a cardiovascular event over 10 years. Is there no hope of sanity returning to National Herd-health Service? If not the costs of dealing with all the diseases that arise from type 2 diabetes will certainly bankrupt the service. Rather off topic, but I’m intrigued by the deleted results you’ve posted and their possible reinforcement of the role of stress in heart disease. While saturated fats do appear to be protective, the countries also appear to be arranged more or less in the order one would expect if they were ordered by how stressful it is to live there. The K-Rations of World War II were almost completely made of carbohydrates with cigarettes furnished by Uncle Sam as well. Because of Katrina, we here in Louisiana were offered U.S. Army rations for weeks on end. No one could open a grocery store. Our gas was gathered from a city pretty far away. The U.S. Army soldiers handed out bottled water and MRE’S. These were “combat rations”. I read the labels as I always do since the food was very good and seemed of good quality. Each one contained 4300 calories and were loaded with trans fat. I think more can be learned from the foods and experiments done with our armed services than with the public in general. They use those in the army for many statistics since they are as captive an audience as one can get I should think. It is easy to track how much and what kinds of foods they are consuming especially in relation to energy expended. Sadly, my family preferred the MRE’S to my cooking. I know and see all over that people are using butter quite liberally, only eating whole wheat breads and pastas as well as brown rice and are reverting back to the recipes we knew when our parents (those referred to as the Greatest Generation) ate as regular fare for many years. Our parents were not overweight. To the contrary, many were quite thin, both men and women. I do believe that Americans are disenchanted with the low fat diet that only works as a starvation experiment. IT DOES NOT WORK. It is an unnatural state in not consuming foods we gravitate to. Eating should be a reward…not a punishment. There is rampant obesity in adults and children. People need animal fat and cholesterol. It satiates the palette and the stomach. Perhaps it is because I live in an area that has a rich history of finely prepared foods and one where food is so important to our social culture, I can firmly say that I recall eating lots of cooking lard and butter as a child. The problems started with sugars in American diet. I am a firm believer that natural animal fat does not cause obesity. Animal fat with easily digested carbohydrates creates obesity as well as CVD and PAD. If only they understood the value of a variety of vegetables with those trans fat and limiting or eating carbohydrates that are healthy and digested slowly, the world would need far less medications. The Atkins diet was and continues to be quite successful for diabetics and people who want to either lose weight or maintain a healthy weighty. With regard to diet and animal fats and cholesterol, Dr. Natasha Campbell McBride may be the only one who really gets it. And…I relate to her views on food consumption an physiology. It just makes sense…common sense. Fantastic cutting-edge research that completely supports Dr. Kendrick’s rejection of statins.